I received an email this week from a client that I assumed I’d never hear from again. It hadn’t been a bad breakup, simply that my main contact left and her replacement had different freelance writers in her stable. With a whopping six-year gap between communications (a personal record), I was reminded of one of my favorite freelance phenomena: Halley’s client, you know, the clients that enter into your orbit only once in a great while. They’re not a bad thing, but don’t exactly provide dependable income, either. Schrödinger’s Project: In Schrödinger’s famous thought experiment, the cat in the box—cozied up with a flask of poison, some radioactive material, and a Geiger counter—is simultaneously dead and alive. In freelance terms, a Schrödinger’s project exists in the same netherworld. Handshakes, letters of agreement, or signed contracts be damned, you don’t have enough information to get started or can’t get a response from the client on next steps. Note that a deposit may not necessarily indicate the alive/dead status of the project in question. Escher’s Project: Unlike Schrödinger’s project, this one is actually in motion. Like an infinite staircase that appears to go up and down, round and round, however, it ultimately ends up right where it started. Most commonly, this phenomenon is found in highly opinionated clients who really, really liked their own original work. In other words, they sought approval of what they created rather than improvement of it, regardless of the quantity or quality of revisions. The only event that can break the illusion is payment in full and moving on with your life. Rorschach’s Scope of Work: A close relative of the back-of-napkin business plan—and sometimes a result of it—this is an assignment with a paucity of information that depends on the perception of the observer. “This is easy, do it cheap!” cries the client. “Oh, goodness, there’s a lot more to this than you realize!” rejoins our intrepid freelancer. If not resolution, an estimate will at least generally bring clarity to the ink blot (which, oddly enough, may resemble a red flag). This phenomenon is particularly hazardous when paired with a Halley’s client. Chesterton’s Business Practices: As freelancers, we encounter a wide range of client types and businesses, many of which have been successful over the long haul. Yet, as a newcomer on their scene, we may see internal business practices, conventions, or styles that confuse, irritate, or enrage us. As Chesterton recommended with the fence of unknown purpose, however, the prudent freelancer first seeks to understand why they exist before tearing them down. 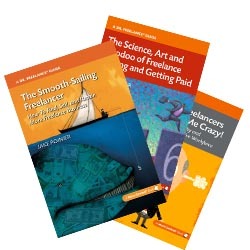 Have you experienced any of these freelance phenomena in your business? What’s the longest it’s ever been for you between two projects with a Halley’s client? Share your tale of woe (or success) in the comments! Jake, great post! The Rorschach’s Scope of Work (and its resemblance to a red flag) really made me laugh. Thanks, Sheila. It’s a concept that’s been kicking around in my head for a while, and was a fun one to write. These are great! Thanks for such an erudite way to wrap up the week. The longest I’ve had was with a Schrödinger client, actually. The project approval took eight months — eight friggin’ months — for them to finally approve. And yes, that meant I waited eight months for payment. Actually, I waited for nearly 12 months, for they were also a bit Schrödinger in their payment process. The Zeno deadline was one of my first clients. A book editing project that went on. And on. And on…. I think I pulled the plug at a year and a half. The “one more thing” requests had gone well over what I was willing to tolerate. Lesson learned, too. From that point to this, I have always included a pay-by date in my contracts. Thanks, Lori. 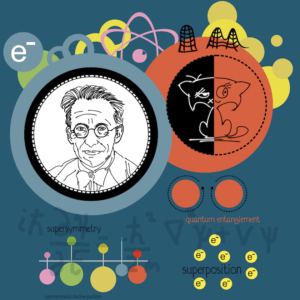 I was ridiculously excited that I found the Schrödinger image, which I thought was a pretty clever piece of art. And yes, the Schrödinger factor can spill over into related functions very easily. I’ve never thought to add a pay-by date, but that’s a great idea. Thanks for commenting and sharing your wisdom!